I love thiss! Super chic! Love the modern grunge style to this look! Btw, I'm hosting a giveaway of a MAWI spiked sphere ring that retails for £295, I guarantee it's a very provocative piece to own! Gorgeous look! Makes me want to get out and get this Zara skirt! The skirt is so adorable and fenimine! Wow, perfect combination, love this outfit! You are so pretty! And you always have nice outfits. Yours is one of my favorite blogs. Cute look! 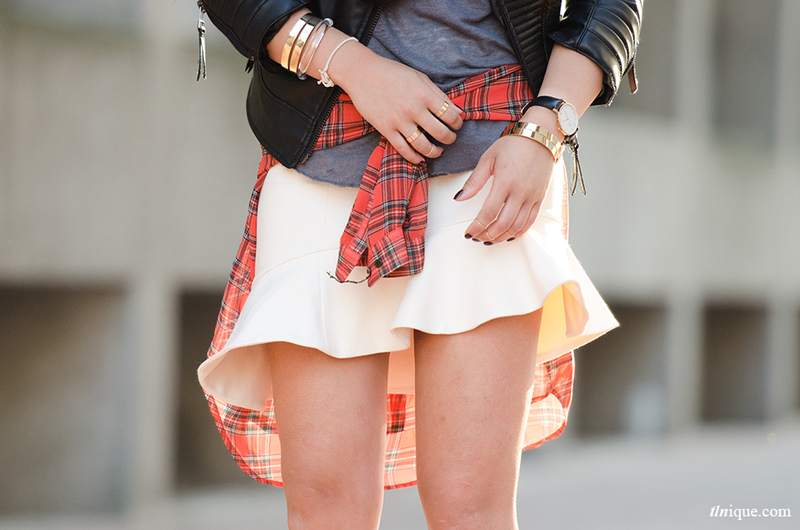 Love the touch of plaid! That jacket is awesome! love the outfit. Another amazing outfit ♥ Love how you pair girly items with more boyish ones ! Love the look!!! super pretty!!! Great outfit !! Love the skirt !! Gorgeous - who doesn't love a flash of tartan? You're gorgeous! Love that you added tartan shirt,it looks so cool! I really like the skirt and also the leather and tartan. The whole outfit looks so great!